Home » Learn How To » So You Think You Can Landscape? 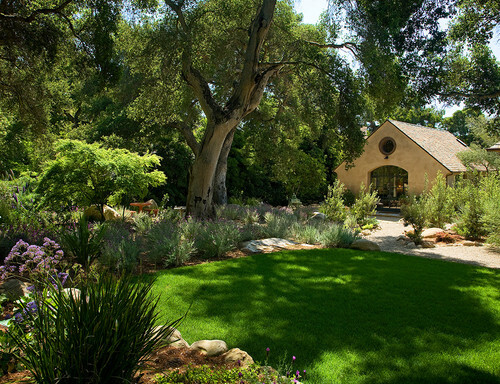 Have you gotten the notion that landscaping your yard can’t be that hard? You’re the kind of do-it-your-selfer who stands to turn that outdoor living space into something unique and personal that could potentially beef up the value of your home as well. Landscaping your property isn’t always as simple as wading into the brush with a few tools and some seat-of-your-pants know-how. You’ll want to plan, prepare, and proceed with a bit of caution, too. Here are some key considerations when it comes to landscaping and some thoughts on when it might be time to hand over the tougher parts of your project to a professional. Make certain that you really have the skills and time to do the job in mind. Consider your professional workload and family commitments, and then, if necessary, divide a general lawn and garden overhaul into several smaller components. It’s better to get a small piece done completely than to end up with a garage full of perishable potted materials and no time to get them into the ground. Also, talk to your nursery or home-center pros; find out what the season might do to your hard work. Stay away from those shoulder-periods when the first frost could leave you with a withered surprise the Monday after a hard weekend of work. Take careful measurements of all the areas to which you mean to introduce plant material. Know the ultimate size and shape of shrubs, greens, and flowering growth that you choose — meaning what they’ll look like months and years out, not just those first couple of weeks after planting. Talk to the sellers about what your choices tend to do, and avoid a spring and summer nightmare of out-of-bounds growth ruining your well-laid autumn plans. Remember to give some thought as well to theme, and think about how to link distinct spaces in such a way that your yard becomes a unified whole, not a crazy-quilt of widely varying styles and textures. Having the right tool for the job can make all the difference. Take a tip from HandyCanadian.com, and price out what you need to buy or rent. The basics are one thing — spades, clippers, rakes, gloves, and all the rest — but the more elaborate your imagination, the more expensive your project may become. Get up to date on two things: (1) any municipal ordinances that apply to changing your property, especially when it comes to water features, areas bordering other private or public land, and excavation; (2) check with your insurance carrier to be certain you’re not undertaking a kind of project that could compromise coverage if you or someone else is injured in the process. Getting the sense that this is all a little more complicated than it seemed at first? Well, don’t despair! The idea is to think it all out ahead of time (what better time to do that than the colder months?). Have you finished an at-home landscaping job that taught its own lesson about what to consider on the planning end? Send us a few lines about your experiences, and share the knowledge with your fellow EiEi Home readers! Planning a landscaping project? Take a look at eieihome’s directory of landscaping contractors.